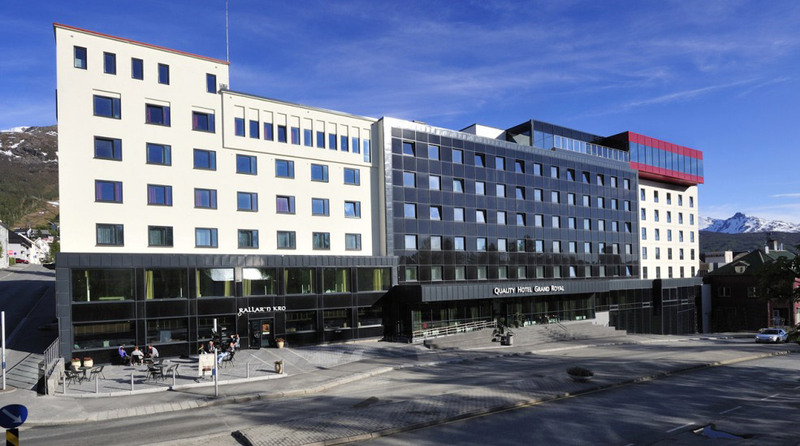 The Quality Hotel Grand Royal is a full-service conference hotel situated in the heart of Narvik. Experience Arctic nature and the nearby Narvikfjellet ski resort, and let your creativity flow at one of northern Norway's leading conference hotels. Below you'll find useful information for those of you planning a stay at the Quality Hotel Grand Royal. Please don't hesitate to contact us in case you have any further queries. Guests are welcome to park free of charge in the parking garage next to the hotel. The hotel has a luggage room where you are welcome to store your belongings both before and after your stay. The Sweet Dreams project is a collaboration between Nordic Choice Hotels and UNICEF that helps children at risk of human trafficking get a safe night's sleep. You can support the project by choosing not to have your room cleaned when you stay with us for more than one consecutive night. All you need to do is hang the Sweet Dreams sign on your door before 11pm. For each room we do not clean, we will donate 10 SEK to UNICEF. This also helps us to minimise the use of chemicals, electricity and water at our hotels. Together we can make a difference! Find out more about Sweet Dreams here. Our free WiFi can be accessed from anywhere in the hotel. Just ask the reception for the access code or log in using your Nordic Choice Club membership number. Are you celebrating a special occasion or maybe you just want to spoil yourself a little? Contact us and we'll advise you on upgrade options.